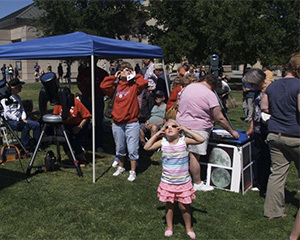 Downing Planetarium, located at California State University, Fresno, is our setup spot for the Solar Observing Day every year during Vintage Days. From either direction, take Barstow Avenue to California State University, Fresno. Turn South on Maple Avenue. You will see the Downing Planetarium, and its parking lot, on your left-hand side. NOTE: Parking in this parking lot may be limited during Vintage Days; be sure to know the route in case you have to use an alternate parking lot.